I find Thanksgiving day always seems to get a bit tense in the last hour before getting everything on the table. Timing all the dishes to come out at once, last minute prep, and everyone coming into the kitchen asking the age old question “Is it ready yet?” or poking their fingers in the pies, hoping to get a sneak-preview taste. Spotted! But then, when I look around to see everyone gather around to sit down at the table, it is at that moment where I feel all the work put into the holiday meal is worth it. Aside from all the food (Thank God), I love when we all take a minute to say what we are thankful for during the meal. These moments are what the holiday is all about, I think. Not to sound too sappy here, if I do please excuse me, but there are many things I am thankful for. What tops the list is my twin boys improving developmentally every day, the bond our family has, and the laughs we share. …lawn that needs mowing, windows that need cleaning and gutters that need fixing because it means I have a home. Okay, okay I will contain my mushy side now. So … Thanksgiving leftovers are just about done. Black Friday madness shopping is done. Now it’s time to enjoy the rest of this long weekend with some pumpkin spice waffles – what fall mornings are about – before the beautiful bright orange fruit drifts away into the sunset until next year. Can you tell I’m a little obsessed with pumpkin? I want it in everything before it’s gone. If you share my obsession for anything pumpkin see my other pumpkin recipes here. 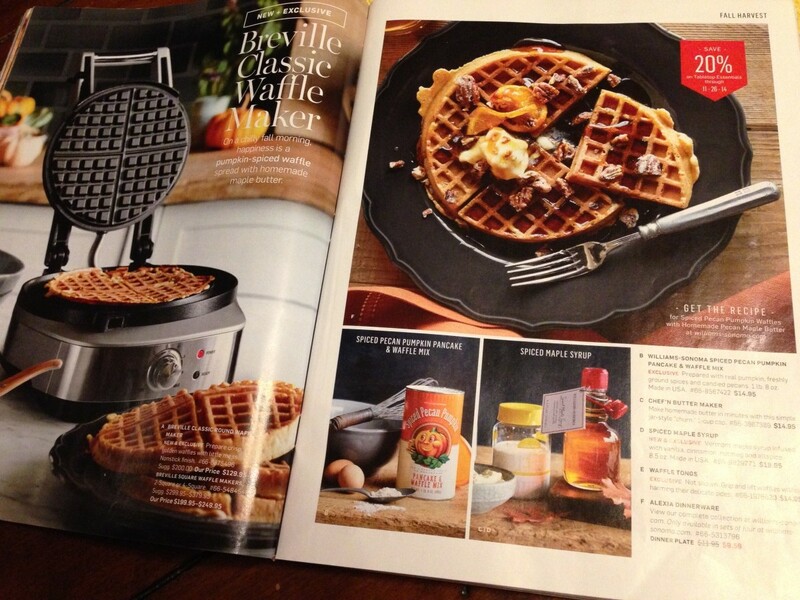 Though my pumpkin spice waffles are not exactly like the waffles in the Williams Sonoma catalog (see online or in stores), on page 55, but they kind of, sort of, look like it. Without the orange (my children adamantly say no to orange slices on their waffles) pecans, and big hunk of butter, that is! My children don’t care for all the extras. Add them on if you like – most likely delicious! What it does have is fresh roasted pumpkin and the warm spices we know, and love. And since it is a holiday weekend let’s add some egg nog in there! You will be so glad you did. 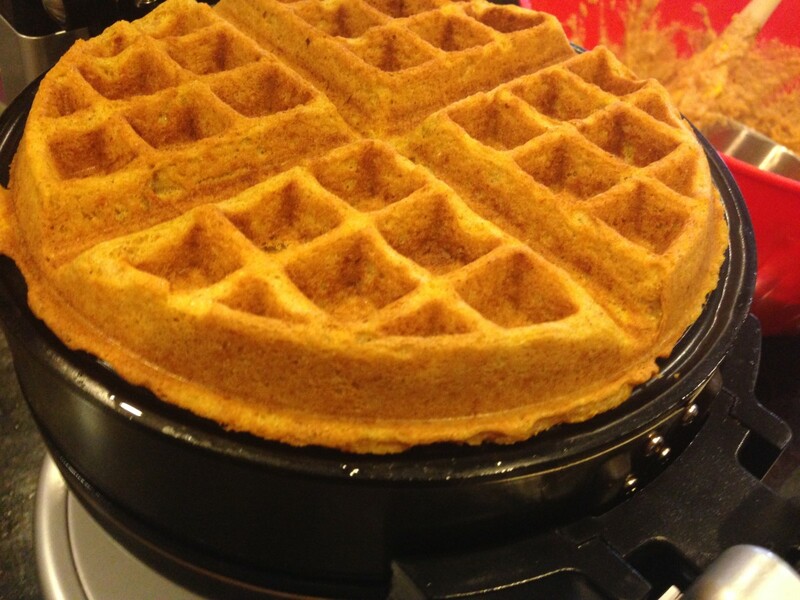 I must tell you, these pumpkin spice waffles will have you craving more. You will not be able to stop at just one (gigantic) waffle. As you go for more, just think of it as a super healthy breakfast, packed with Vitamin A, fiber, and all the other good stuff. No kidding, it is, and a very healthy alkalinizing food. Okay, honestly speaking, you really won’t be thinking healthy, so just go for sin here. Add on the extra whipped topping and syrup. You can have a salad later. Because all you will think about is how delicious this is, how crispy the edges are, how moist the center is … and how the heck this can be gluten free, dairy free, egg free, and soy free? Be calm and slather on. 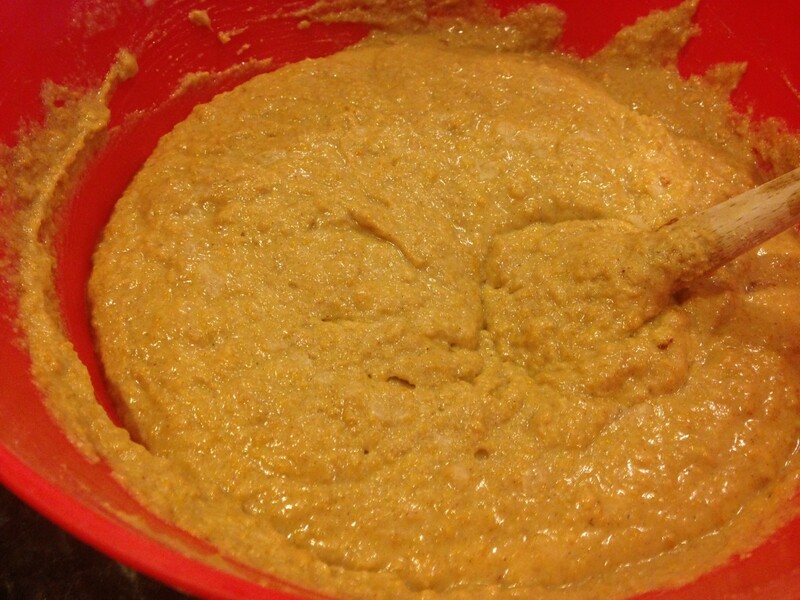 Meanwhile, in a small bowl whisk to combine brown rice flour, tapioca starch, sorghum flour, flax seed meal, salt, baking soda, and baking powder, pumpkin spice, cinnamon, and nutmeg. In a large bowl using a hand mixer or a stand mixer fitted with a paddle attachment, mix coconut oil, maple syrup, pumpkin puree, vanilla extract and sugar beginning on low speed, to avoid splatter, then increase to medium high speed until fully incorporated and smooth. Add banana or eggs (one at a time). 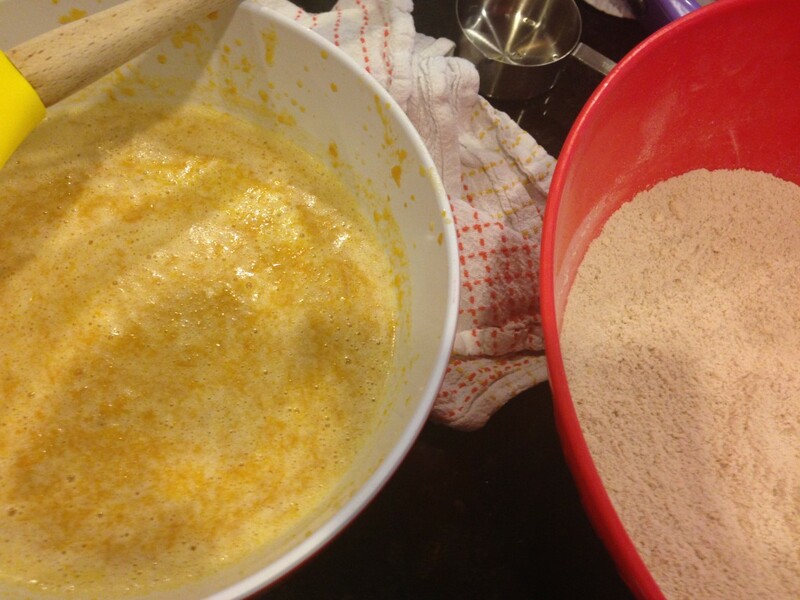 Add dry blend and “buttermilk” in alternating in two additions and ending with the dry blend, mix until just blended. Do not over mix. Scoop batter onto a hot waffle iron with a 1/2 cup dry measuring cup. I love the 2 sided Waring Waffle maker, which makes waffle making go quick. When ready, serve with whipped topping, maple syrup, and a sprinkle of cinnamon. The smell of pumpkin spice in the air … yum. This is what breakfast in the fall is all about. Pumpkin spice waffles are what autumn is all about. Such a touching poem and post. Made it through Thanksgiving with your sweet potato casserole, mock mash, no bake cheesecake all yummy. Also made my Mom's pumpkin pie with the same GF crust from apple pie. It was a gluten free Thanksgiving and no issues! Yum and Yum. I love that last bite pic! Also the post, how sweet. That waffle looks sinful so I will "be calm and slather on!" I LOVE that LOL. Thanksgiving was good, not too much drama. Brought over to my aunt's the chorizo cornbread stuffing and also made your butternut squash and sweet potato gratin to make sure I have a few things I can eat gf, df just in case. Recipes were pretty easy and they were a hit! "Be calm and slather on" made me chuckle, cute and heartfelt post. Need that waffle. And the whipped topping OMG. That poem is beautiful. It does say it all. 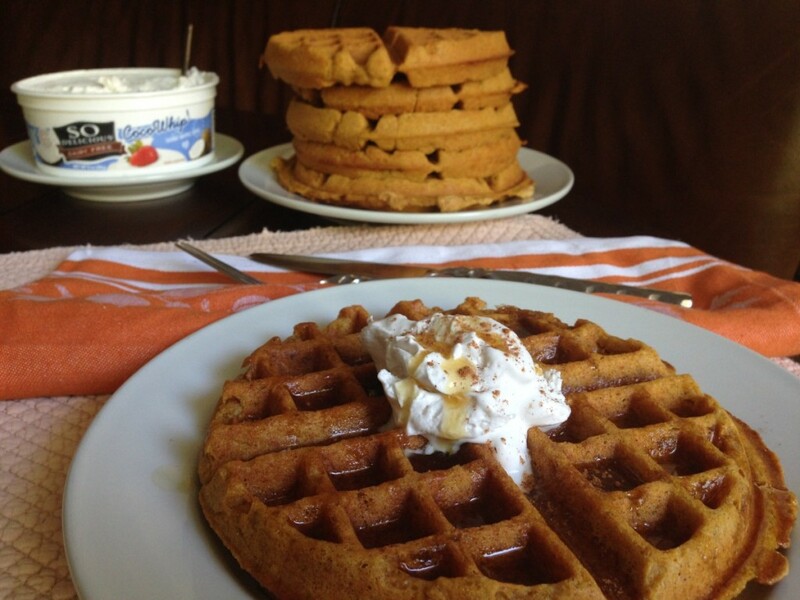 I want this pumpkin waffle recipe, it has everything I love in it. Need my husband to make these. My husband made your apple pie and spiced pumpkin bundt cake for dessert. Both were delicious, but the apple pie made us all weak at the knees. WOW is all I heard. Good gluten free, dairy free pie isn't easy. This would be such a treat to make tomorrow. Looks delicious! Touching post Jessica, I feel the same way about family. Family is where the heart is. 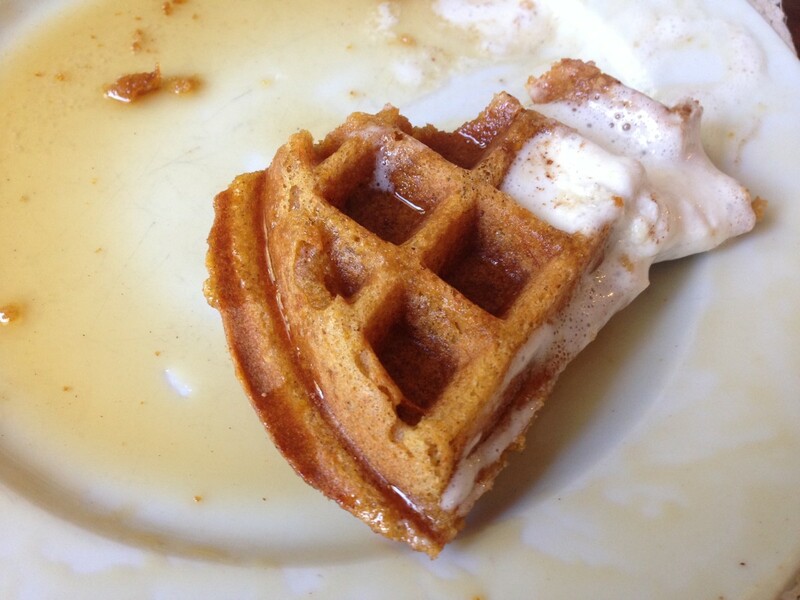 I have to work today and all I'm going to be thinking about is this whipped cream "slathered on" this pumpkin waffle. I will try to "be calm" LOL. Still stuffed from Thanksgiving but how can I not make room for pumpkin waffles! Pumpkin in anything please. I made some of your Williams Sonoma Project recipes, everyone loved it and couldn't believe they were dairy free and gluten free like the sweet potato gratin, pumpkin bundt cake, no bake pumkin cheesecake and the wild mushroom stuffing. I was busy cooking away! Wonderful! Happy to hear and thank you for sharing!! I'm still recovering from Thanksgiving meal too! That poem gets to me everytime, it really does sum it all up. Had to laugh out loud at "be calm and slather on" so funny! Your post was a nice read this morning and I get this amazing waffle recipe with that? You are the best! Now I need to find this whipped topping that looks insanely good. Aww, thank you for the sweet comment. The So Delicious site should have store locations. It's at Whole Foods Market, if you have one nearby give them a call to check stock. Enjoy! Sure, you can sub with chia seeds or pecans. Pecans go very well with pumpkin spice. Enjoy! This looks wonderful, like all your recipes. I wish I had a waffle maker right now. Can I make this into a pancake? The poem was so touching to read and about your Thanksgiving day. It gets so stressful in my house with my family bringing things that are not gluten free, which is why I always host and cook extra because they still don't understand celiac too well. Now I'm rambling, but wanted to say it went well with the help of your recipes. The big hit was the focaccia stuffing and frozen pumpkin mousse pie from last year. Waffles look so yummy! I don't think I have ever seen egg nog in a waffle recipe. I can't wait to try this, it looks delicious as all your food does. Your post touched me, made me laugh and enticed me all in one short read! I think I recovered from my food coma by now. Have to tell you your apple pie is now a new tradition in the Wagner home. So is the parsnip sweet potato gratin. It was awesome. Pumpkin waffles is what fall is about. I cannot wait to try this tomorrow!! That apple pie does take some work but so worth it. Happy to hear you enjoyed it as much as we do as well as the gratin :) Thank you for sharing!! Glad you didn't post a left overs recipe. I love Thanksgiving but had enough :) Love everything pumpkin and these look amazing! Never thought about egg nog in waffles hmm. Why don't I have a waffle maker??? "Be calm and slather on" - LOL! My kids don't care for oranges or any fruit on their waffles. Whipped topping however they will like! Yummy weekend breakfast!! I just found you on once a month meals and I love your heartfelt thoughts about your Thanksgiving and the poem was beautiful. The waffles look incredible and I am going to make these tomorrow for our family's post holiday brunch. Nice mix of autum and holiday flavors with the egg nog. My family and in laws will love this. We all loved the sweet potato casserole, stuffings, the best fried onions on our mashed potatoes, and the pumpkin bundt cake! Some of my guests couldn't believe there wasn't any flour or butter in the food. I fooled them! Thank you for sharing your comment, and so glad you enjoyed everything!! 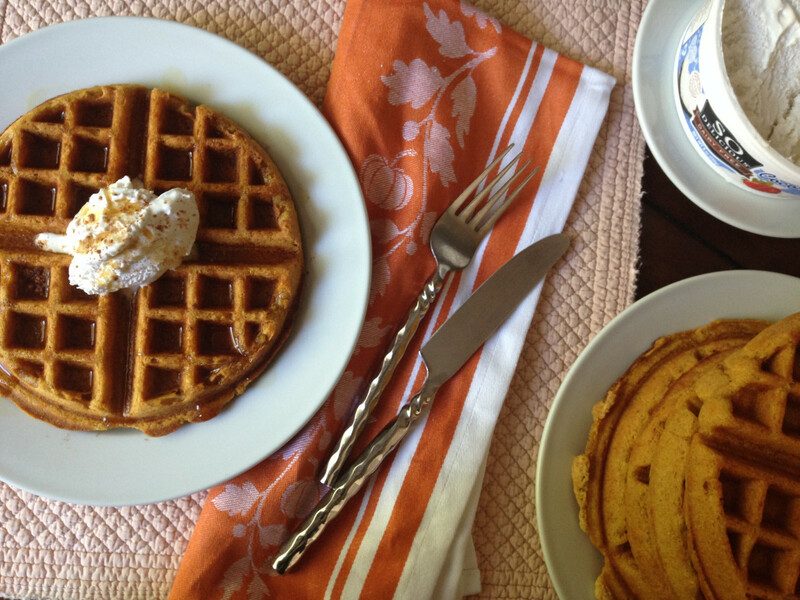 We just finished our pumpkin waffles and had to tell you that they came out amazing! I added 1/4 cup of chocolate chips for fun with whipped cream and maple syrup slathered on of course! We finished up the egg nog in our coffee. Great recipe Jessica. Thank you for sharing the inspiring poem to remind me of all the things to be thankful for. It was nice to read. I went ahead and made these waffles today after seeing whole foods had the whipped cream and also the egg nog on sale even though it's been a long weekend and what a treat it was. Love how orange they turned out from the pumpkin but more than that how it tasted like pumpkin spice not just like a sweet waffle. Thank you for creating GF/CF recipes with such flavor. That does not look gluten free! I need to make these, I haven't had good gluten free waffles in over a year since diagnosed with Celiac and look forward to trying your recipe this weekend, whipped topping included! im waiting in line at the dentists office and seeing this and now want to leave and just make these instead!